Okay. At least my dreams are…. This IS, by FAR, my most favorite salad ever. It is an entire meal in a bowl. And even better is that my whole family will eat it. The basic recipe comes from a favorite restaurant of ours here in Scottsdale, Cowboy Ciao. We have adapted it over the years to fit our own special diet restrictions, but no matter what you do to this salad, it is still amazing. The Stetson Chopped, as it is called here, is a salad with a quirky combination of salty/sweet/chewy/crunchy flavors and textures that will completely surprise your palate in that totally oh-so-good way. The magic that comes from the combining of these flavors is sheer bliss in your mouth. It can be tailored to meet most food allergies, by subbing a few ingredients here and there, or leaving some out all together. You can even get creative with your own ingredient ideas as well. And it is fairly simple to throw together. The most time consuming part is chopping up a few ingredients for the salad and then whirring the dressing away in the blender for a minute. The fun part is in the presentation. 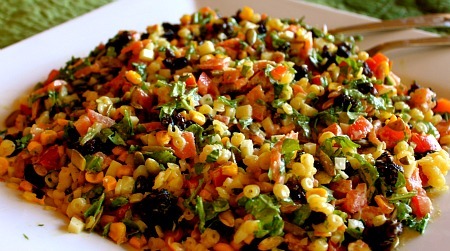 It is a salad that will surely “wow” your guests when you bring it to the table. The amazing color combinations of the wonderfully fresh ingredients lined up so dramatically on the plate is definitely a conversation piece. But the best part is when you pour that amazing dressing over it all and create a cornucopia of flavors for the palette! And like I mention above, when I have not had it for a while, I seriously start to dream about it. So…because I am definitely craving it right now, I am sharing this amazing Allergy-friendly chopped salad with you again. And, I just may dare to say, that once you have tried it…you may start dreaming about it too! Not quite so pretty this way…but this is when the pure MAGIC happens. Trust me on this. 8 oz Asiago cheese, cut very fine (For Dairy-Free: Omit, or try one of the Vegan Cheese alternatives, reading ingredients if also allergic to Soy)- If using Vegan cheese, cut amount in half since it will have a different flavor and texture than Asiago. 3. While couscous or noodles and the corn are being prepared, prepare dressing by blending the pesto sauce, mayo, and shallots in food processor blender. Slowly stream in buttermilk, then add lemon juice, salt, and pepper. This makes more dressing than needed for the salad, but it is wonderful saved for another use. 4. For a dramatic presentation, line each ingredient in a row on a nice platter and place on the table. Then pour desired amount of dressing on the salad, toss, and season with salt and pepper to taste. Otherwise, for a simple presentation, place all of the ingredients in a large shallow bowl, toss with dressing and salt and pepper, and ENJOY!!!! This is being shared with Allergy Free Wednesdays. We are on the same wavelength SO much of the time! I can completely understand why you would crave this salad. I love the way it looks lined up in sections. It’s gorgeous. 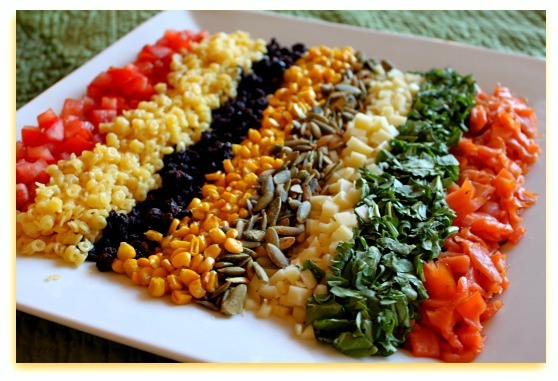 I’m into salads right now and simply having a different way to display the ingredients makes salad prep more fun. This is lovely. Can’t wait to try my own version on guests. Thanks for the inspiration, Kim. I can always count on you for healthy and creative! I feel like nobody gets as excited about salads as I do. You just made my day! I love the platter of ingredients. So beautiful! This salad looks and sounds like my dream come true too! Hey Kim! This sounds amazing. I am excited to make this this weekend. Do you recommend making the dressing in advance for the flavors to “blend” or can you make it at the last minute? Hey Kelly!! Thanks, girlie! You can totally make this dressing in advance. Just shake it up again right before you add it to the salad. And you can also make most of the salad a head of time as well. The salad, when it is all mixed together, is even good the next day as well. Does not get soggy and yucky like a lot of salads. You are the queen of magnificent chopped salads! Remember the very first time I went to your blog, I was wowed by a chopped salad you shared? And I’ve actually enjoyed one of your chopped salads in real life … again, magnificent! I’m all over this one when I return from my travels. 🙂 Hope you guys have a fabulous Memorial Day! That dressing has me drooling..in combo with all those crunchy veg and nuts?! Can’t wait to try it! Wowzah!! I love the presentation in the top photo, but I think the mixed salad looks great, too! I really do have to try this (one of these days, I’ll attempt Daiya cheese. . . or just make my own!). I’m all over salads this summer. . .yum! Oh My! This is so my kind of food! I love salads all laid out pretty like that and I love thaose flavor combos!!! That salad does look like a dream come true! I am starving just looking at it-I bet it tastes amazing! Thanks Laura! It is pretty yummy, for sure. This heat we have here right now has me craving salads for sure!! I know you love this one, Mom! Maybe Michael will be able to eat it now if he is feeling a bit better! Thanks, Maggie. This is one of our favorites. I change up the ingredients all of the time to whatever veggies and nuts I have on hand. But, i am totally craving salad too right now, especially with this heat wave we are having! I might actually die if I don’t eat this. Oh geez. I cannot let that happen. Delivering a plate personally…hang tight! Yep. That’s definitely a keeper. 🙂 Thanks so much Rogene!! This salad looks soooo good!!! I can’t wait to try this! I am very new to eating this way so, Kim I was wondering are you planning on putting this app for Androids??? I just bought one & I’m thinking about trading this in for an Iphone for the this App!!!! But I really don’t want to but I LOVE this site (app)!! PLEASE!!!! Thanks Kim!! I will be using your website (recipes). I hope you get the kinks worked out, can’t wait!!!! I am so thrilled with all you wonderful women, you make it so much easier for people like me that have no clue or talent & knowledge!!! I am fairly new to this kind of eating. Thank you.. thank you.. thank you!!! Sonia, you are welcome! 🙂 So glad to help. I love this community… everyone has such creative ideas and always so helpful! Any time you have a question, feel free to ask me! You can email me under my Contacts tab! Oh my goodness, I so crave salads and this looks just too, too good. I love that the arugula is chopped small, since it is such a pungent green. Do you make your own mayo Kim, or use vegan or store-bought? Alisa, I have made my own mayo many times. But, when I am using it for dressings, I usually just use one of the store-bought ones since you are mixing it with other ingredients. Mindful Mayo has come out with a really natural new mayo that uses olive oil and is free of all of the bad stuff. It works well in this dressing! this looks awesome, love it in all the sections and when it’s mixed it reminds me of 100’s and 1000’s but savoury!